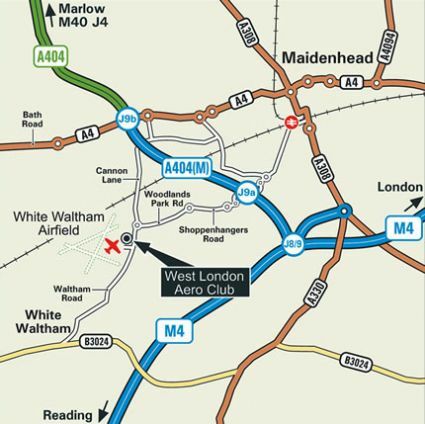 Directions: M4 – To find us at West London Aero Club take junction 8/9 on to the A404 (M). After 500 yards take the first exit 9a, signed to White Waltham. Continue following the signs to White Waltham for just over a mile via five mini roundabouts, 10 yards after the last roundabout the entrance to the airfield is marked by white railings in the hedge on your right. From the M40 leave at junction 4 signed to the M4. After approx seven miles leave the A404 at junction 9b and take the A4 to Maidenhead. At the next roundabout, approx 20 yards away, turn right into Cannon Lane. At the end of Cannon Lane turn right at the mini roundabout. The entrance to the airfield is marked by white railings in the hedge on your right. Opening Hours – 08.00 hrs 7 days a week all year round. Closing times – Winter months – Monday to Friday operations will close at 5.30pm. During the weekend operations will close 30 minutes after sunset. WLAC is the owner and operator of White Waltham Airfield. The Airfield is situated just off the Waltham Road, next to White Waltham, near Maidenhead in Berkshire.